In a normal winter, our annual holiday week ice sculpture is ready for demolition after New Year’s Day as daytime high temps above freezing, sunlight, and mixed precipitation take their melting toll. But in the early winter of 2017-2018, Pinchy, a 10-foot long, multi-ton, blue lobster has been thriving in the record cold. Not to say, that he has not had his weather challenges. Snow can become pasted onto exposed ice sculptures, precipitation can pockmark their fine finishes, and wind can just knock them down. Yesterday’s blizzard offered a trifecta of all three hazards, but a well-placed tarp and some TLC from Aquarium staff kept him unscathed. As the strange and historic winter storm surge pushed sea water down nearby streets, the temporary flooding did not significantly affect the Aquarium’s Central Wharf. Large lobsters share a common temperament with junkyard dogs – suspicious, ill-tempered, and ready to defend their territory. Pinchy’s presence seemed to offer a lot of luck and a little deterrence. The water in the neighborhood receded with the falling tide, the snow has been cleared, and the Aquarium T stop reopened Friday midday. The downtown waterfront is back to normal. Pinchy is excited about the weekend’s frigid blast. 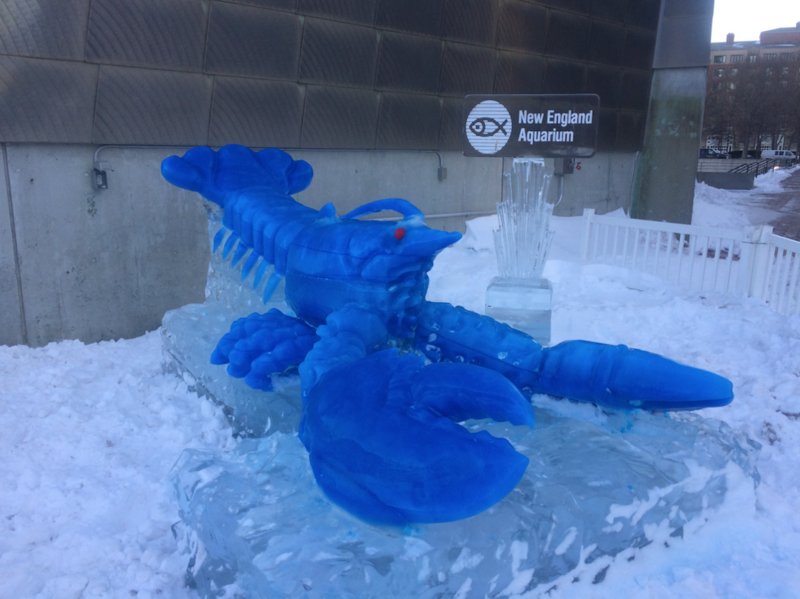 If he can hold out until January 10, he will be the longest-lived ice sculpture in the Aquarium’s history!